Our RGV250 race systems are being used in competition throughout the World and this experience has allowed us to develop our exhausts to be the best available in the market. Our latest systems provide excellent power, ground clearance and weight saving. Available in two configurations, and two materials please select the system that suits your requirements. 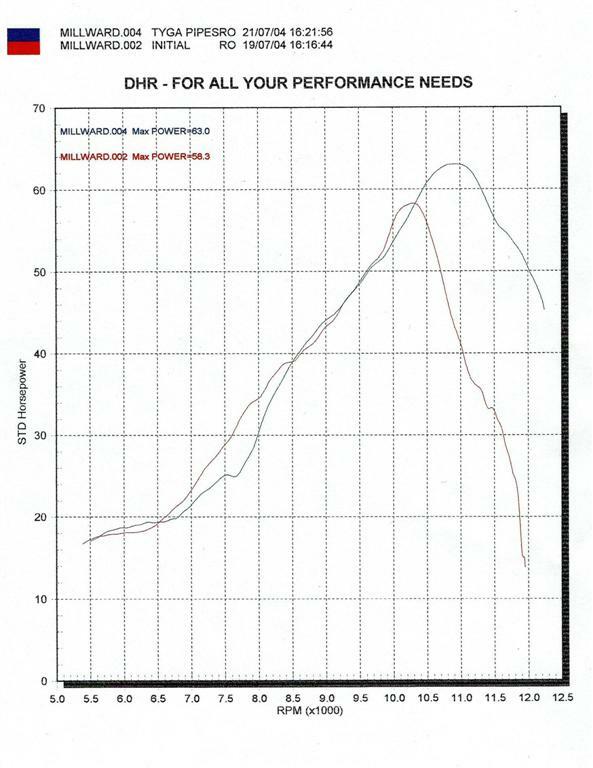 Below is a graph showing the power output of an RGV250. This independent test was conducted in the UK by Triple MMM Racing and compares the TYGA Performance EXCS-0010 stainless steel GP system, to a stock Suzuki system. 1 X double clamp and mounting hardware on GP systems (the systems with two silencers stacked on top of one another exiting on the right of the bike) to mount to original position on subframe. B. )2 X silencers of your choice. Each silencer is provided with mounting hardware and we will badge them according to the chamber set you order. For the GP systems, you will get a right side badge on one silencer and an unbadged silencer. On the side by side, you will get a left badged and a right badged silencer.